The following are some of the cars I’ve owned over the years. This is a pretty small collection given the total number of cars I’ve had, but these were some of the most memorable for a wide variety of reasons. This was the first car I bought with my own money. 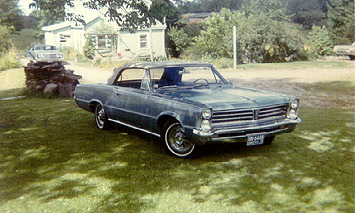 It replaced a 1961 Ford Fairlane 500 that had been passed from my mother down through an older brother and two sisters. By the time I got it, it had 250K miles on it and was heavily rusted. When the transmission finally let go, it was time for something else and this Pontiac was perfect. It only had a 6-cylinder engine and a 2-speed automatic, but it was a gorgeous car and incredibly stylish for a high school kid from a working poor family. I got it at 16 and drove it through two summers before it was destroyed by a wrong-way drunk driver on I-84 in Waterbury December 26, 1970. 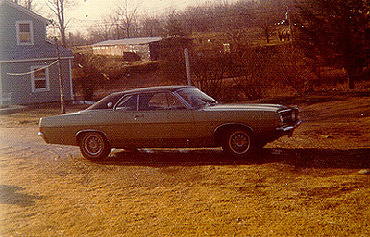 This Torino was the car I got while I was in the Navy. It had a 390-4V coupled to a C-6 automatic transmission. The formal roofline set it apart from the fastback Torinos of the day, but this car was a real performer. Unfortunately, all that performance came at a cost. I can still remember driving back to the Philadelphia Navy Yard from Connecticut during the 1973 gas crisis and trying to nurse it from rest area to rest area on the NJ Turnpike when I could only buy $2.00 of gas at a time. Back then, that was 3 or 4 gallons, but that was still only good for 45-60 miles at a shot. 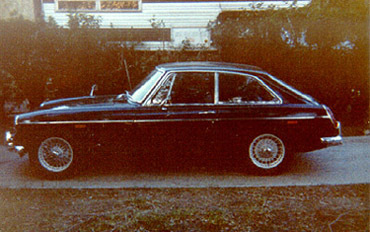 I picked this car up as a project at some point near the end of my enlistment, but I never ended up restoring it. Instead, it became a car I drove around the meadows of the farm we rented from my fathers boss. That, in hindsight, wasn’t the best idea and would probably get me a video clip on “World’s Dumbest” today. But I was a teenager or early 20-something in farm country and it was fun. I eventually wrecked this car while on the way to the home of the girl who had agreed to buy it from me and put myself in the hospital at the same time. Fortunately, the Darwin principle was taking the day off and I survived to grow older and wiser. But this sure was a fun car while it lasted! Fast forward a few years and I’m now married and living in Los Angeles. I sitll haven’t lost my enthusiasm for British sports cars. This was a perfect little GT in British Racing Green and I enjoyed the heck out of driving it. Unfortunately, I was beginning to experience some long-term knee problems from the drunk driver accident in 1970 and needed a double arthroscopy. Getting in and out of the MG was problematic and it ended up being sold in favor of a Toyota SR-5 pickup. Fast forward a few more years and we’ve moved from Los Angeles to the Worcester, MA area. 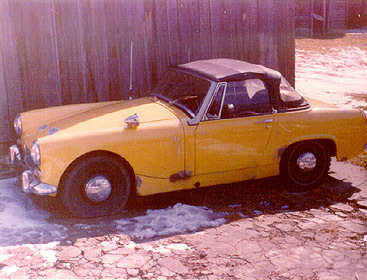 Our careers are going well, we have a bit of disposable income and it’s time to have a toy car again, so I bought this MGB from Burnett’s Garage, an original British Leyland dealership on Boston’s North Shore. The MG did need some restoration, though, and asking around about local British car mechanics led me to Dave Croteau of Uxbridge. 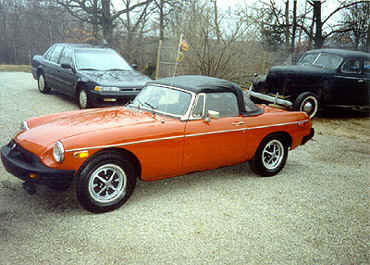 Dave owns and operates D.C. Auto Restoration and he stripped the MG down and did a complete restoration on it. The picture at the left was taken the day we picked the car up from him. I had a lot of fun in that car, but it ended up being sold a few years later during a period of recession-driven unemployment. 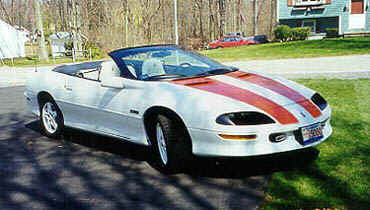 So the 1994 Corvette was traded in on a factory-ordered Z-28 with the LT-1, 6-speed manual, and the 30th anniversary white and orange package. I even got the dealer to give me the showroom print depicting the new Camaro at the gas pumps with a ’69 pace car on the other side and a ’67 RS/SS peeking out of the garage in the background. This was a fantastic car and I don’t remember now why I sold it. But it went to a teenager as a gift and as I warned the grandfather at the time, he wrecked it within a year or so. 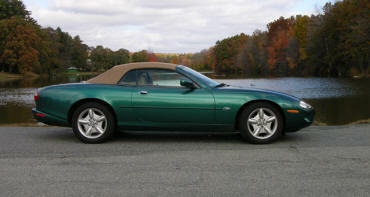 In between Cheshire Cat and CatVert, I ended up buying a Jaguar XK-8. I came upon this car the day I sold Cheshire Cat. The owner drove up from Connecticut hoping to arrange a trade of his car for mine. By the time he arrived, someone had clicked the Buy It Now option on eBay and Cheshire Cat was no longer for sale. Still, I was intrigued with the Jag and took it for a test drive. What an incredible car! So we struck a deal and the Jag became my 3-season daily driver, much the way the Crossfire is now. The Jag was sold when my wife and I were raising capital for the business we were in the process of purchasing, so the cars had to go and that included the Jag. 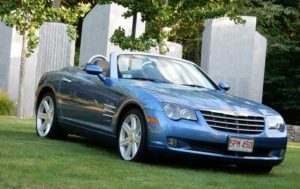 A few years later I decided I wanted to get another luxury-oriented touring car and found this Crossfire on eBay. It was fairly close, just a couple of hours away in the White Mountains of New Hampshire, so I checked it out and struck a deal witht the seller. It was delivered to my house on Thanksgiving Day of 2009 and provided 5 years of driving enjoyment. 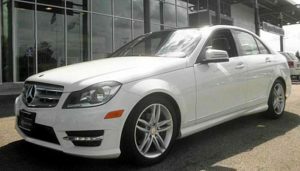 But all things must pass and the Crossfire has headed on down the road, replaced with a 2012 Mercedes-Benz C300 Sport 4MATIC. The Mercedes C300 is an awesome car. It’s quiet, smooth, responsive, and comfortable. But I found myself walking past it every day to drive my 2004 Jeep Wrangler Sport with over 100K miles on it, so I decided to trade the Mercedes in on a 2014 Jeep Wrangler Rubicon.